Cardinal Resources Limited (ASX/TSX: CDV) ("Cardinal" or "the Company") is pleased to announce an optimised Ore Reserve estimate for the Namdini Gold Project ("Namdini") in Ghana, West Africa. 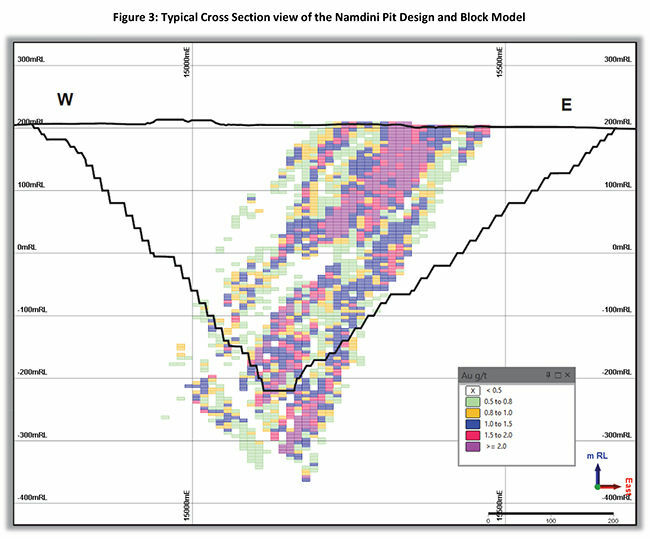 "We are extremely pleased that our optimisation of pit designs, wall angles and mining schedules, has upgraded the company's Life of Mine Ore Reserve position to 5.1 Moz, up from 4.8 Moz, reinforcing the Namdini gold deposit as of one of the largest undeveloped gold discoveries of the past decade. "We're very fortunate to have a significant higher grade portion within the Life of Mine Ore Reserve starting essentially at surface. This allows for a rapid capital payback during production of the First Stage Pit. It is anticipated that the First Stage Pit will see approximately 1 Million ounces of gold produced over an approximate three‐year period at an expected lower strip ratio and a higher average head grade of approximately 1.3 g/t gold based on a process plant throughput of 9.5 Million tonnes per annum. "We are confident that this optimised Life of Mine Ore Reserve, can deliver strengthened financial results within the Feasibility Study which is rapidly advancing to completion. Given the projects large Ore Reserve, low strip ratio, high conversion of the Mineral Resource and rapid payback from the anticipated higher grade, lower strip ratio of the First Stage Pit, it is expected that the company will have access to attractive project finance to achieve the best outcome for shareholders." The resource drilling comprises east‐west trending traverses of easterly inclined holes. Hole spacing varied from around 12.5 by 25 metres in shallow portions of southern part of the deposit to around 50 by 50 metres and broader in the north and at depth. Tables 1 and 2 highlight the Mineral Resource estimation reported at a 0.5 g/t Au cut‐off grade. Currently, the 0.5 g/t Au cut‐off grade approximates an operational parameter that the Company believes to be applicable. This is in accordance with the guidelines of Reasonable Prospects for Eventual Economic Extraction ("RPEEE") per the Canadian Institute of Mining, Metallurgy and Petroleum "CIM Definition Standards for Mineral Resources and Mineral Reserves" (CIM, 2014) and the Australasian Code for Reporting of Exploration Results, Mineral Resources and Ore Reserves (the JORC Code 2012). Refer to Sections 1, 2 and 3 of the JORC Code 2012 Edition Table 1 criteria in Appendix 1. The effective date of the Mineral Resource estimate is the 4th February 2019. Geological and structural modelling: Logging, interpretation and modelling were undertaken by Cardinal Resources' technical staff and specialist structural consultants Orefind Pty Ltd.
Survey Control: Drill hole collars were surveyed using differential GPS (DGPS), with most diamond holes and deeper RC holes down hole surveyed at intervals of generally around 30 metres using electronic multi‐shot and gyroscopic equipment. Resource Estimation: MPR Geological Consultants Pty Ltd ("MPR") (QP/CP Mr. Nicolas Johnson) estimated recoverable Mineral Resources for Namdini using Multiple Indicator Kriging ("MIK") with block support adjustment, a method that has been demonstrated to provide reliable estimates of recoverable open pit resources in gold deposits of diverse geological styles. The mineralized domain used for the current study was interpreted by MPR and Cardinal geologists on the basis of two metre down‐hole composited gold grades and captures zones of continuous mineralization with composite grades of greater than nominally 0.1 g/t Au. The domain trends north‐northeast over 1.3 km and dips approximately 70o to the west with an average horizontal width of approximately 240 metres. The Mineral Resource can reasonably be expected to provide appropriately reliable estimates of potential mining outcomes at the assumed selectivity, without application of additional mining dilution or mining recovery factors. Variance Adjustment: The resource estimates include a variance adjustment to give estimates of recoverable resources at various gold cut off grades. The variance adjustments were applied using the direct lognormal method. The variance adjustment factors reflect comparatively large scale, open pit mining consistent with Cardinal's perception of potential mining scenarios. The variance adjustment factors were estimated from the variogram model for gold grades assuming mining selectivity of 5 metres by 10 metres by 2.5 metres (across strike, strike, vertical) with high quality grade control sampling on an 8 by 12 by 1.25 metre pattern. The variance adjustments can reasonably be expected to provide appropriately reliable estimates of potential mining outcomes at the assumed selectivity, without application of additional mining dilution or mining recovery factors. The Ore Reserve for the Project is reported according to the Australasian Code for Reporting of Exploration Results, Mineral Resources and Ore Reserves, JORC Code 2012 and Canadian Institute of Mining, Metallurgy and Petroleum "CIM Definition Standards for Mineral Resources and Mineral Reserves" (CIM, 2014). The Mineral Resource was converted applying Modifying Factors. The Proved and Probable Ore Reserve estimate is based on the Mineral Resource classified as Measured and Indicated. 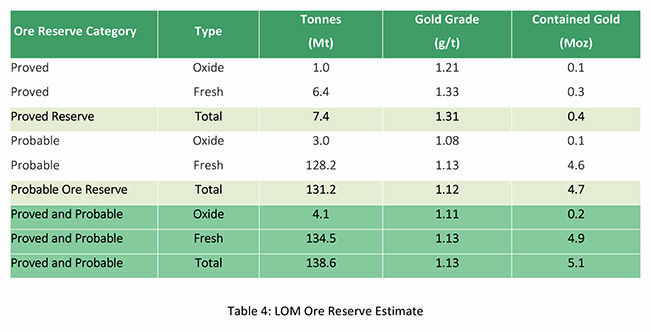 Table 4 presents a summary of the Ore Reserves on a 100% Project basis. The Ore Reserve conforms with and uses JORC Code 2012 recommendations and Canadian Institute of Mining, Metallurgy and Petroleum "CIM Definition Standards for Mineral Resources and Mineral Reserves" (CIM, 2014). 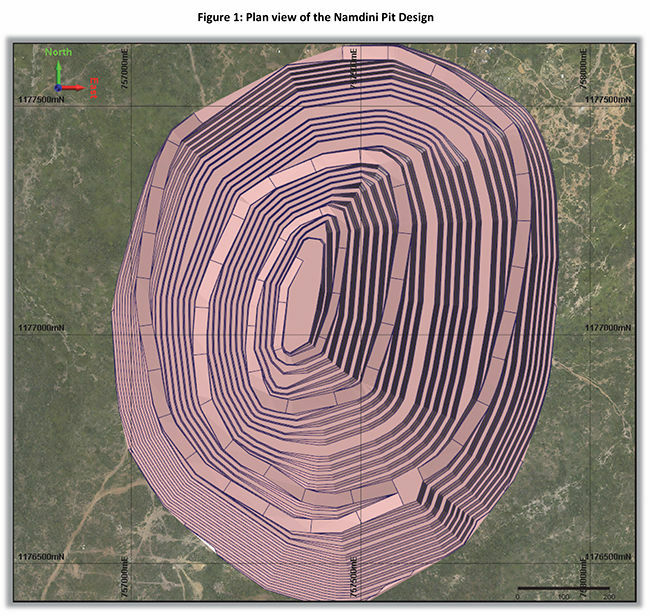 Trial open pit optimisations were run in Whittle 4XTM software to define the base of potentially economic material. Four cut back pits were then selected and full mine designs applied. The Ore Reserve reported in this announcement is a sub‐set of the Measured and Indicated Mineral Resource which can be extracted from the mine and processed with an economically acceptable outcome. Mining of the Namdini project will use conventional open pit mining equipment. The mining process will include drill and blast as well as conventional load and haul operations. There is expected to be a limited amount of free‐dig material with the majority of material assumed to require drilling and blasting. Mining will be carried out using staged cut‐backs with four identified stages incorporated within the LOM final pit. The mining schedule incorporates movement of ore and waste on 10 metre mining benches, by year for each of the four mining stages. The in‐situ deposit Mineral Resource Model is the basis for the mining model used for the Life of Mine (LOM) pit planning and assessment reporting. The resource model has cell dimensions of 12.5 metres (east) by 25 metres (north) by 5 metres (elevation). The MIK variance adjustment assumes a moderately selective mining unit (SMU) of 10 metres x 5 metres x 2.5 metres, which has been applied to Namdini's large‐tonnage, disseminated deposit. Mining will consist of a conventional hydraulic shovel operation typically using 400 tonne class excavators in a faceshovel configuration and 130 tonne class rigid body dump trucks hauling on designed access roads. An auxiliary mining fleet of dozers, graders, water carts and utility vehicles will support the mining operation. A gold cut‐off grade of 0.5 g/t Au was applied to the mineralised material. Process costs and mining costs were supplied by independent consultants and compared with similar gold projects. Gold grades were supplied with the model as estimated proportional grades using the MIK recoverable resource estimation technique. 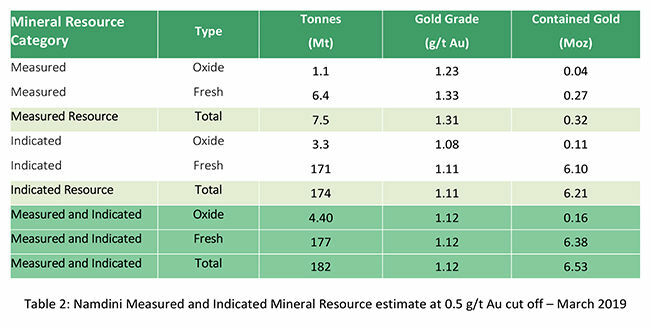 For purposes of selecting the optimum Whittle pit for mine design purposes, Golder Associates estimated a mining base surface cost of USD $2.86 / t of rock mined based on experience with similar mining operations in the region, which includes grade control sampling, laboratory assay analysis and supervision costs. The input process and G&A cost were estimated at USD $14.30 / t milled plus an additional USD $1.50 / t allowance for stockpile reclaim - all tonnes were assumed to be on a dry basis. Metallurgical test work as reported in the pre‐feasibility study, was used to estimate the recoverable fraction from the Oxide, Transition and Fresh ore components, with gold grade and proportion of the block at varying MIK cut‐off points coded in the block model. Using the identified marginal Cut‐off Grade, the proportion of ore per parcel and gold grade above the Cut‐off Grade were included within the mining model to allow export of the parcelled (ore + waste) blocks to the pit optimiser for open pit optimisation. Inter‐ramps (bench stacks) in slightly weathered to fresh rock should consist of four benches. These are to be separated by 25 metre ramps or geotechnical berms. This means that a 25 metre geotechnical berm should be included after every 80 metres of fresh rock benches. Pit optimisations were completed using the Lerchs‐Grossman (LG) algorithm in Whittle 4XTM software to calculate the optimal pit at specified input parameters that were determined prior to the study. A wireframe pit shell for each gold price considered was the resultant output. One of these was selected as the base for the final LOM pit design. A pit of approximately 1 Moz was chosen as the First Stage Pit to maximise discounted cash flow and minimise capital payback time. The maximum mining movement has allowed for a strip ratio of up to 2 : 1 in order that the initial optimisations are not 'mining‐limited'. The final Life of Mine strip ratio is 1.9 : 1. The pit design considered the geotechnical requirements for berms, face angle batter and catch‐berms for the lithology within the block model to establish the engineered pit design in which the Ore Reserves are contained. The pit was designed with four stages, the initial stage being for early access to the higher‐grade ore near the surface. The second stage is largely an expansion of the initial stage targeting the ore to a greater depth. The stage designs were created for optimal ore delivery from the first two stages due to their low strip ratio and waste rock movement. The third and fourth stages contain a greater proportion of waste rock. 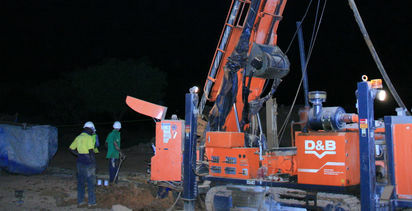 A minimum mining width of 80 metre was established between the stages. The pit designs have targeted the maximum discounted value pit shell at a USD $1,225 / oz gold price. The pit optimisation using the Whittle 4XTM software was used to identify the optimum pit shell with the Inferred Resource material considered as waste rock. The identified pit was then considered for practical staging in order to minimise waste movement and improve the cashflow for the project. The analysis allowed the selection of four stages with the initial stage targeting a relatively higher grade area of ore near surface. Access was allowed to the first three stages by a ramp from the northern edge of the pit as the volume of waste rock in the first three stages is considered modest. The final fourth stage has a main access ramp on the western side of the pit to provide a shorter haul to the waste rock dump given that the final stage has a higher strip ratio than the preceding three stages. Having the primary access on the western side of the pit reduces waste rock haulage costs and thus improves the overall value. The term ‘Ore Reserve' is synonymous with the term ‘Mineral Reserve' as used by Canadian National Instrument 43‐101 ‘Standards of Disclosure for Mineral Projects' (NI 43‐101, 2014) and conforms with CIM (2014). The JORC Code (2012) is defined as an ‘acceptable foreign code' under NI 43‐101. The Ore Reserve referred to in this announcement is based upon a Proved and Probable Ore Reserve derived from Measured and Indicated Mineral Resources. No Inferred Mineral Resources have been included in the estimation of Ore Reserves. The Mineral Resource is prepared in accordance with both the Canadian Institute of Mining, Metallurgy and Petroleum "CIM Definition Standards for Mineral Resources and Mineral Reserves" (CIM, 2014) and the Australasian Code for Reporting of Exploration Results, Mineral Resources and Ore Reserves (the JORC Code 2012). Refer to Sections 1, 2 and 3 of the JORC Code 2012 Edition Table 1 criteria in Appendix 1. 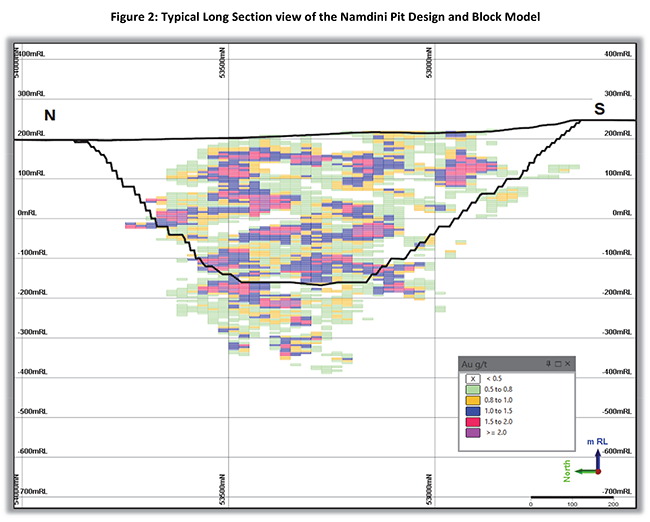 The Company is focused on the development of the Namdini Project through a resource expansion drilling programme and is now advancing the feasibility study supported by additional multi‐disciplinary engineering activities. All production targets for the Namdini Gold Mine referred to in this report are underpinned by estimated Mineral Resources and Ore Reserves which were prepared by competent persons and qualified persons in accordance with the requirements of the JORC Code and National Instrument 43‐101‐ Standards of Disclosure for Mineral Projects ("NI43‐101"), respectively. The information in this press release that relates to Namdini Ore Reserves and mining studies is based on information compiled and reviewed by Mr Glenn Turnbull, a Competent Person who is a Chartered Engineer and Member of the Australasian Institute of Mining and Metallurgy and a full‐time employee of Golder Associates. Mr Turnbull has sufficient experience which is relevant to the style of mineralization and type of deposit under consideration and to the activity which he has undertaken to qualify as a Competent Person as defined in the JORC Code 2012 and is a qualified person for the purposes of NI43‐101. Mr Turnbull has no economic, financial or pecuniary interest in the company and consents to the inclusion in this report of the matters based on his information in the form and context in which it appears. The information in this press release that relates to Namdini Mineral Resources is based on information compiled and reviewed by Mr Nicolas Johnson, a Competent Person who is a Member of the Australian Institute of Geoscientists and a full‐time employee of MPR Geological Consultants Pty Ltd. Mr Johnson has sufficient experience which is relevant to the style of mineralization and type of deposit under consideration and to the activity which he has undertaken to qualify as a Competent Person as defined in the JORC Code 2012 and is a qualified person for the purposes of NI43‐101. Mr Johnson has no economic, financial or pecuniary interest in the company and consents to the inclusion in this report of the matters based on his information in the form and context in which it appears. The scientific and technical information contained in this press release is based on information compiled and reviewed by Mr Richard Bray, a Competent Person who is a Registered Professional Geologist with the Australian Institute of Geoscientists and a full‐time employee of Cardinal Resources Ltd. Mr Bray has sufficient experience which is relevant to the style of mineralization and type of deposit under consideration and to the activity which he has undertaken to qualify as a Competent Person as defined in the JORC Code 2012 and is a qualified person for the purposes of NI43‐101. Mr. Bray is a full‐time employee of Cardinal and holds equity securities in the Company. Mr. Bray has consented to the inclusion of the matters in this report based on the information in the form and context in which it appears. This ASX / TSX press release has been prepared by Cardinal Resources Limited (ABN: 56 147 325 620) ("Cardinal" or "the Company"). Neither the ASX or the TSX, nor their regulation service providers accept responsibility for the adequacy or accuracy of this press release. By its very nature exploration for minerals is a high‐risk business and is not suitable for certain investors. Cardinal's securities are speculative. Potential investors should consult their stockbroker or financial advisor. There are a number of risks, both specific to Cardinal and of a general nature which may affect the future operating and financial performance of Cardinal and the value of an investment in Cardinal including but not limited to economic conditions, stock market fluctuations, gold price movements, regional infrastructure constraints, timing of approvals from relevant authorities, regulatory risks, operational risks and reliance on key personnel and foreign currency fluctuations. Certain statements contained in this press release, including information as to the future financial or operating performance of Cardinal and its projects may also include statements which are ‘forward‐looking statements' that may include, amongst other things, statements regarding targets, anticipated timing of the feasibility study (FS) on the Namdini project, estimates and assumptions in respect of mineral resources and anticipated grades and recovery rates, production and prices, recovery costs and results, capital expenditures and are or may be based on assumptions and estimates related to future technical, economic, market, political, social and other conditions. These ‘forward - looking statements' are necessarily based upon a number of estimates and assumptions that, while considered reasonable by Cardinal, are inherently subject to significant technical, business, economic, competitive, political and social uncertainties and contingencies and involve known and unknown risks and uncertainties that could cause actual events or results to differ materially from estimated or anticipated events or results reflected in such forward‐looking statements. Cardinal disclaims any intent or obligation to update publicly or release any revisions to any forward‐looking statements, whether as a result of new information, future events, circumstances or results or otherwise after today's date or to reflect the occurrence of unanticipated events, other than required by the Corporations Act and ASX and TSX Listing Rules. The words ‘believe', ‘expect', ‘anticipate', ‘indicate', ‘contemplate', ‘target', ‘plan', ‘intends', ‘continue', ‘budget', ‘estimate', ‘may', ‘will', ‘schedule' and similar expressions identify forward‐looking statements. 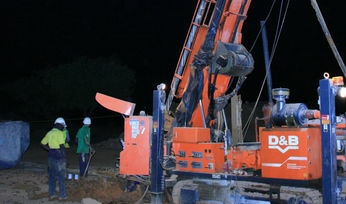 An African gold-focused exploration and development company.